Lampiran 1. The lifting boom and balance boom adopt cantilever boom structure, which reduces the hoisting modular and makes it more safe, convenient and flexible to install and uninstall, and reduces the requirements for hoisting equipment and the site. Maklumat lain 5. The extra-long boom is designed with a rope-supporting trolley, and the speed of which is 1/2 of that of the luffing trolley, which can achieve the most optimum rope-supporting effect. The structure has applied for national patent. 6. The lifting mechanism adopts speed regulation by frequency control or by eddy current brake series resistance, featuring good lifting performance; The slewing system adopts frequency control by torque electric motor or by coil winding type electric motor with hydraulic coupler, featuring smooth operation and small slewing impact. 7. 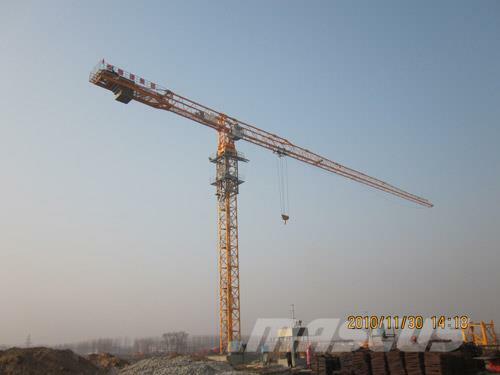 All kinds of safety devices are reliable and easy to adjust; both the safety monitoring control system and traditional safety system are available, the double system ensures safety operation of the tower crane; the hydraulic system adopts low/medium pressure design, featuring higher safety and reliability.